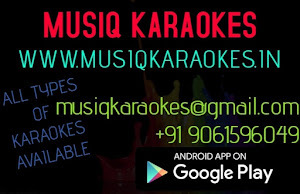 www.musiqkaraokes.in is our new online music store which sells Mp3 karaokes and yamaha midis. You can purchase your favorite karaoke tracks from our store at lower rates than the regular price. You can also listen to original songs and karaoke demos of selected products. We will upload new products every day. Visit regularly to find new products and discount offers . For easiness, we have also added Offline Payment methods for those who face difficulties on online payment. You can also contact us for creating new karaokes and yamaha midis of any song . Musiqkaraokes. Watermark theme. Powered by Blogger.